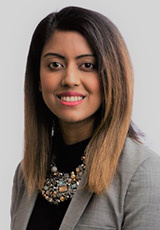 Jasmine Alam is a part-time faculty member at UNB Saint John and a full-time Assistant Professor at the Shannon School of Business at Cape Breton University. Previous to her position at the Shannon School of Business, she taught as a full-time faculty member in the Faculty of Business at UNB Saint John and at Rollins College, USA. In 2017-2018 she was the recipient of the Departmental Award for Teaching Excellence and nominated for the Allan P. Stuart Award for excellence in teaching at UNB. During her doctoral studies, she was the recipient of the Queen Elizabeth II Diamond Jubilee scholarship and the Elizabeth Parr-Johnston graduate scholarship. Jasmine Alam earned her PhD in Interdisciplinary Studies: Management and Economics at the University of New Brunswick, Canada. She holds a BA in Economics from Carleton University and has studied at the University of London (London School of Economics and King’s College) where she holds an MA. Her research on micro-finance institutions in the North American context, new social business forms, and corporate social responsibility have been published in the International Journal of Social Economics and Journal of Small Business and Entrepreneurship contributing to broader areas of management, institutional economics, and entrepreneurship. Dr. Alam is currently working on projects relating to benefit corporations, social entrepreneurship, and entrepreneurial ecosystems in North America. Prior to working in academia, Dr. Alam worked at the Department of Finance Canada and PriceWaterhouseCoopers in Ottawa, Canada.